We’ve optimized the web-check creation and configuration process to deliver maximum availability-monitoring value with just a few clicks. Click the Web checks tile on the Dynatrace homepage. Click Add web check in the menu bar. 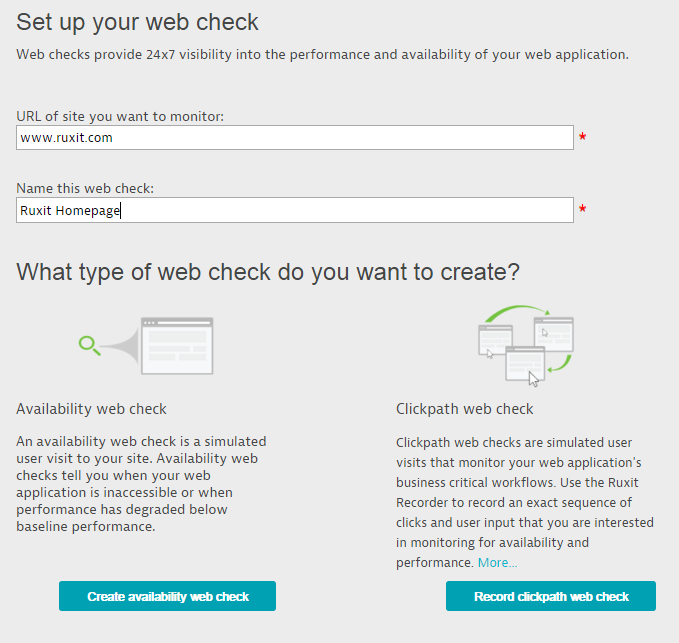 Type the URL, name your web check, and select a web check type (Availability web check or Clickpath web check). Availability web checks monitor the availability of a single URL. Choose the frequency at which you’d like to monitor your website. Expand your coverage by monitoring from any of our 13 global locations. Understand how often we check your site’s availability. Add a performance threshold for the duration of your web check. Customize how you’d like to be notified of availability outages. Bypass web-based login forms with LoginSense technology. If you have a password-protected page you need to bypass, use this setting to load the password automatically. Clickpath web checks monitor the availability of any business-critical workflow with just a few clicks. Our robust recording technology ensures that all workflow actions are monitored for availability and performance without requiring you to code pesky scripts. To utilize this functionality, use a Chrome browser and download the Dynatrace Recorder browser extension. If Dynatrace doesn’t detect the extension automatically, you’ll be prompted to complete a quick installation. Once installed, the Dynatrace Recorder automatically opens alongside the clickpath configuration page. Click through a critical business workflow in your application and click Finish to complete the configuration. Note that performance thresholds can’t be configured during web check creation. Once a web check runs we auto-discover any actions that generate network activity and provide you with load times as well as an option for setting a performance threshold. Our updated clickpath editor helps you understand and customize recorded actions. Click thumbnail view to display expanded screenshots. Don’t like the default action name we provided? Create your own name. Add text or element validation to ensure that actions load the correct content. Customize the type of wait you’d like to use for this action. You can choose to wait for the page to load completely, wait for all network activity to stop, or wait a custom amount of time or for a specific element to appear. You even have the advanced option of customizing the locators we use for DOM interaction.